Thor is the fighter in his family! He is feisty and chock full of shenanigans. 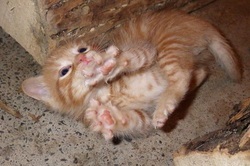 He loves wrestling with his brothers on the wood-pile in his foster home, and has no fear of other cats and dogs. Do you have room for such a bold heart in your home?